Get “hooked” on Gift Folios ~ available year round for all occasions! Purchase our signature Folio for those “hard to shop for folk” ~ ships USPS Priority; arrives quickly (the perfect gift for the one you love) . . . 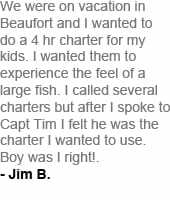 Gift certificates for fishing charters offered year round, in a limited quantity, to insure you will have availability for the times you need to take your Cast Away Fishing Charter Adventure! For that hard to shop for angler, a fishing gift certificate is a well deserved and much appreciated gift. Christmas! Holidays! Birthdays! Anniversaries! Father’s Day! Fishing Gift Certificates are not redeemable for cash. Any cancellations by the Captain will be rescheduled at a later date. Bait charges are not included in this certificate unless stated and are at bait stand prices. The holder of the gift certificate is responsible for making their reservations for the fishing charter date and time with the Captain. Gifts you will never forget!